If you're thinking about giving body modification a try, ear piercing is a great way to begin. Ear piercing is one of the most popular and socially accepted ways to alter your body. It's also one of the most simple. This type of body piercing involves creating a small hole through part of the outer ear. Usually this is done in the lobes, but piercings can also be made in the cartilage around the outer ear rims. Another common spot is the conch, that small piece of cartilage just above and in front of the lobes. Once an initial piercing is healed, additional holes can be added if you desire to create your own personal style. Typically, ear piercings are made using post and clasp type earrings with specially sharpened tips. These earrings come in pre-sterilized packages designed to be loaded into either a standard spring loaded piercing gun, or a hand operated piercing cartridge. Surgical grade steel is the best material for a fresh piercing because it is hypo-allergenic, but 14 or 24 karat gold is also a good choice. Even though both of these tools will get the job done, some professional piercing shops still prefer to carry out piercings using surgical needles because the extremely sharp tips leave little or no scarring on the tissue. They also decrease the amount of healing time. Since there is always a risk of infection involved anytime the skin is pierced, it's extremely important that all piercing professionals follow these basic hygienic procedures to keep their clients as safe as possible. Piercers should always wash their hands thoroughly, and wear protective gloves during the entire procedure. The piercing area should be covered with a disposable drape to catch any fluid. The client's ears should be cleansed with an alcohol wipe prior to piercing. The pre-sterilized piercing earrings should be carefully loaded into the chosen piercing mechanism without coming into contact with any other surface. All single use tools and materials should be properly disposed of immediately after the procedure is finished. 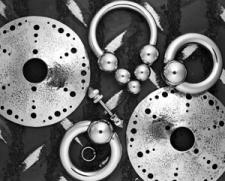 Reusable piercing items should be cleaned and disinfected in an autoclave, or ultrasonic disinfectant unit. Piercers should wash their hands after the procedure is finished, discuss aftercare for the piercings and provide written instruction for the client to take home. The healing period for lobe ear piercings is usually about eight weeks. Cartilage piercings can take as long as twenty-four weeks to heal. During this time, the piercings must be kept very clean to promote healing and avoid infection. Always wash your hands before touching your piercings or earrings. Soak a cotton ball or swab with disinfectant solution and clean the front and back of the piercings three times a day. Gently turn your earrings about 1/4 of the way around each day to help keep the tissue from adhering to the posts. Carefully dry your ear piercings with a tissue if they become wet. Showers offer less chance for bacteria to enter your piercings than baths. Always keep a pair of earrings in your ears for the first year to keep the holes from closing. Because ear piercing has the potential to cause an infection, it should only be carried out when you're in good physical health. Piercing should be avoided if you are currently pregnant or have any of the following health conditions. Some parents believe that the earlier a child's ears are pierced, the better. Young babies generally don't notice the jewelry in their ears, so they don't finger them the way older children do. This lessens the chance of infection during the healing process. Although piercing a baby's ears is fairly safe, most physicians recommend waiting until after the child has received a D.P.T. booster (usually at about eight weeks old). Ear piercing can also be the initial step in a practice called lobe stretching. Once the piercing is created and healed, the holes are gradually stretched by inserting increasingly larger gauged posts. Eventually, the holes are large enough to begin inserting flesh plugs or tunnels, pieces of body jewelry that are large enough to look through. While at-home ear piercing kits are available, it is usually far safer to have your piercings done by a professional. You can check with your physician to see if he/she offers this service, or you can usually find piercing shops in your local mall.